The Barong and Rangda have always been two sacred symbols among the Balinese Hindus, dances that are performed in consecration. But now with the passing of time, these two symbols’ functions have expanded into tourism ambassadors and are popular with tourists. The sacred Barong and Rangda are treated as sacred, but the commercial ones are also available to support tourism and the economy. Barong dances, among the most sacred in Bali, symbolize the intertwining of good and evil and the complex relationship between man and the supernatural. The term barong can apply to the dance, the mask, or the character depending on context. The barong animal mask represents good, and its types include the tiger, boar, and buffalo; the most characteristic, however, is the barong kek, a mythical animal. Evil is personified by Rangda—literally “widow,” but interpreted as a witch associated with spirits of the dead. Several men armed with keris (daggers) accompany Rangda when she enters. Under her influence, they go into a trance and stab themselves, but are protected from injury by Barong’s presence. Barong’s eventual victory is taken to affirm his protection of the village. Both barong and rangda masks are kept in the village temple between performances. Though interpreted as good versus evil, the two sides are more equivocal, and Barong’s victory is never regarded as conclusive. According to the ancient Calonarang manuscript, Rangda is a moniker for a widow of overwhelming desire or unrepressed fury sparked by revenge. The manuscript is from old Javanese literature that hails from the 11th century. It tells about a widow who possessed supernatural powers, but unfortunately she used those powers to spread terror over the people. At the end of the story the widow duels with Empu Bharadah, a clergyman emissary of the king. During the battle the widow became transformed into Rangda, a bloodcurdling figure, whereas the Empu changed into Barong, the supernatural form of a mythical lion. The Calonarang story is often performed during Odalan temple anniversaries. By midnight the community gathers in the outer courtyard of the temple. The ’show’ starts in a nerve-jangling atmosphere as a scene depicts villagers falling victim one by one to the black magic spell cast by Calonarang. They conduct ceremonies meant for the dead as though they were really all dead, while ogres dance throughout the rituals. The atmosphere becomes even more chilling when you are warned never, ever to leave or go home while the performance is in progress. People believe that real evil spirits may have taken form and are on their way to ‘attend’ the feast… and that you could bump into one or more of them on your way home. The Calonarang ends near daybreak when it depicts the Barong successfully defeating the evil widow. The people leave the temple grounds in groups. Creepiness is still in the air, but curiosity causes most people to want to watch it again in the future. Mysterious things always lead to curiosity. Balinese Hindus see the Barong not only as a figure in the Calonarang legend or dance performances depicting the same tale. The Barong itself is believed to be a protective symbol that resides over a certain region. He is placed in a temple and worshipped by a certain name. For example, the people in the village of Panjer in Denpasar revere Sang Hyang Ratu Mas in the configuration of a Barong there. Sang Hyang Ratu Mas descends from His abode while the sacred dances are performed on certain pre-determined days. Not all Barongs are sacred or placed and worshipped in a temple. Besides supporting historical literature, there is also quite a long and complex process in the creation of its physical form. The mask of the Barong is made from pule wood, a special wood believed to have magical properties. The other parts such as the hair also comes from special materials such as peacock feathers and horse mane. In each of its production stages, a good and certain day is always chosen. The last is a pasupati and mejaya-jaya ceremony to spiritually endorse the result. Pasupati is a ceremony to ask for the certain spirit to descend and reside and endow it with its spirit and powers. Majaya-jaya is to ask for blessings at some major temple such as Besakih. These final steps make the Barong sacred. As times have passed with the growth of tourism in Bali, many things have changed. Not a few sacred symbols have been commercialized and have become amusement for tourists, including the Barong and Rangda. Tourism cooperates with art groups, who then perform Barong and Rangda performances for tourists – anywhere and anytime. 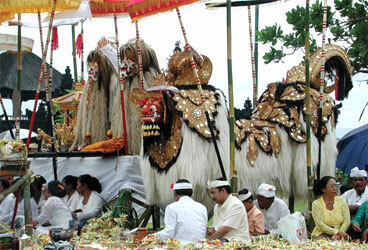 Barong and Rangda have become very famous, now identified as icons of Bali. When people see a picture of Barong or Rangda, it is unmistakably reminiscent of Bali. Both of them have become icons indeed. As Bali grew to become a favourite tourist destination, so were the demands to have Balinese handicrafts as a prestigious token. The demand for Bali’s handicrafts is increasing and among the many are the Barong and Rangda. You can easily find replicas in the Sukawati art market. The craftsmen of Ubud can also make masks by order. People do not have to wait for the right auspicious day to start a process. The tourists proudly wear t-shirts with Barong masks printed on them – known as ‘baju Barong’, available in all colors and sizes. It is ‘proof’ that they have ‘been to Bali’. The craftsmen mass-produce these items so they can now easily be found in art markets or shops everywhere. On the economic side, the Barong and Rangda have provided the local craftsmen and businessmen with profits, through not only retail but also wholesale and overseas exports. This was a shining prospect bright enough for the development of the people’s economy. Balinese elders would have never known about the significant shift of its meaning and function. On the other hand the Balinese now are quite wise in making a clear separation between the sacred and the commercial. The sacred Barong is still treated specially, but the commercial are also available to support tourism and the people’s economy. This distinction was made so that both of them could walk in their respective paths without overlapping each other. Sacred is a part of religion that is basic for the Balinese. On the other hand, tourism and the economy are important things as well. The eerie impressions of the Barong are not as strong as before. The commercialization is one reason. The technology development is also another. Before, the villages did not have electricity so people were easily frightened with scary stories while they were in the dark. But now electricity is along the village roads and if people are still scared to watch a performance on site, they can always watch it on the local TV station.